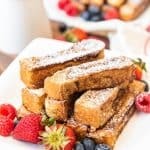 Perfectly dippable and delicious, these Cinnamon French Toast Sticks are a bite-sized brunch option that are a tasty breakfast treat for kids and grown-ups alike! Cut each slice of bread into 4 sticks. In a large bowl, whisk together the eggs, cream, vanilla, sugar, and cinnamon. In a large pan, melt 1-2 tablespoons of the butter over medium heat. Working in batches, dip a few of the sticks of bread into the egg mixture at a time, turning to coat, then let the excess egg mixture drip off and place the sticks in the hot pan, being careful not to overcrowd the pan. Cook the french toast sticks on each side, flipping until each side is golden brown and crispy. Transfer to a plate and sprinkle with powdered sugar. Serve with maple syrup. Day-old, slightly stale or dried out bread works best for french toast because it soaks up more of the custardy egg mixture. You can use cream or milk for this recipe. Cream is a little more rich and custardy, but milk works too. To freeze: Lay the cooked french toast sticks on a cookie sheet lined with parchment paper. Freeze for 2-3 hours, then transfer to a freezer-safe zip-tight bag. These can be reheated in a microwave, the oven at 300 degrees for 10 minutes, or by toasting them again in a pan.